Toronto, September 2, 2015 – Thanks to the generosity of Canadian Feed The Children’s (CFTC) key funding partner Ipsos Foundation, groundbreaking has begun at the site for a new school in northern Ghana after structural flaws made the original school unsafe. 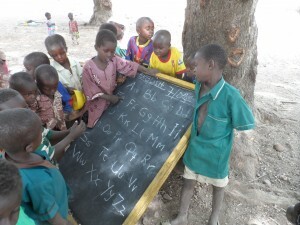 Parents from Kpachelo in the Northern Region of Ghana have been sending their children to school, only to have them sit in makeshift classrooms outside where they are exposed to harsh weather. This has been their reality since the local primary school was condemned for being unsafe because of significant damage caused by movement of a fault line underneath the school. Without any alternatives, the teachers at Kpachelo L/A Primary School were forced to move their students outside under the trees to learn last year. In order to continue their education, 122 boys and 126 girls from grade 1-6 are exposed to severe weather throughout the school year. With support from Ipsos Foundation, Canadian Feed The Children has moved to address this critical need to build a new school on safe land for the children of Kpachelo. The urgency for a new school cannot be overstated. 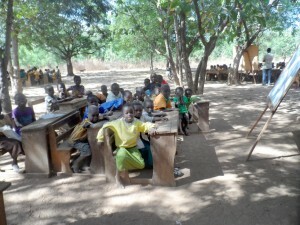 In northern Ghana the rainy season begins in April and lasts until September, and without shelter in the outdoor classrooms, student attendance drops and teachers struggle to teach. In addition to the high temperatures, the open area gives no protection against the harmattan – a dry, dusty desert wind that blows from December to March, which can cause several health issues. 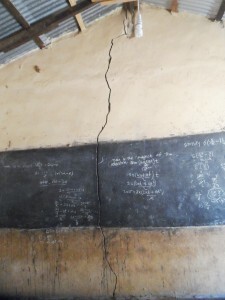 “We currently have our classrooms under trees as a result of the cracked nature of classroom walls, which is making teaching and learning difficult,” explained Ibrahim Basha, a teacher at Kpachelo L/A Primary School. Without intervention the staff believes the school would have to shut down altogether, leaving students with few alternatives. In a community that has become characterized by chronic malnutrition, illness, high school dropout rates (especially among girls), and an annual food shortage that can last up to four months, keeping children in school with nutrition programs can be lifesaving. CFTC has been actively supporting the staff and students at Kpachelo L/A Primary School since 2008 including the sponsorship of 131 child ambassadors. CFTC was made aware of the infrastructure challenges through our local partner, Regional Advisory Information and Network Systems (RAINS) – an organization that works to improve education for children in rural communities in northern Ghana. The investment from Ipsos Foundation will provide a six-unit classroom block and an office, the construction of latrines (which are essential to keep adolescent girls in school), quality school supplies, a school garden, and the continued support of a parent-teacher association. The entire project is expected to be completed by spring 2016. We look forward to sharing updates over the next year on this exciting and much-needed project, which exemplifies the incredible impact that we can have on children’s lives when we work together.